It was the gunshot heard across the USA. 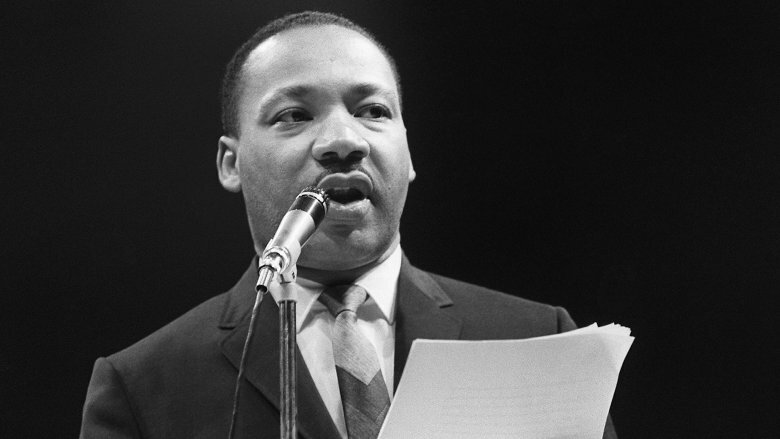 On April 4, 1968, civil rights leader and all-around hero Martin Luther King Jr. was shot through the head at the Lorraine Motel in Memphis. The gunman was James Earl Ray, a disaffected white man from an impoverished background who was later apprehended trying to escape to Rhodesia via England. To call the events surrounding King's assassination a major historical event would be to redefine the term "understatement." With the possible exception of the Kennedy assassination four and a half years earlier, no other killing in the 20th century affected the U.S. so much. So given the unimaginable historic importance of the shooting, you might expect it to have been so thoroughly analyzed by so many experts that nothing new could be learned about it. You'd be wrong. There are so many question marks still hovering over the death of MLK that the Riddler could refit his entire wardrobe with them. On September 30, 1962, the town of Oxford, Mississippi, exploded. Angry at the enrollment of a black student at the University of Mississippi (Ole Miss), white supremacists organized a riot that killed two people and put 300 in the hospital. In the subsequent investigation, one of the names that made it onto the FBI's radar was J.C. Hardin, an alias for White Knights' associate James Ashmore. Fast-forward six years and an angry man named James Earl Ray was holed up at the St. Francis Hotel in Los Angeles. It was March 1968, and Ray was a month away from killing the most famous black leader of them all. It was at this point that he started receiving calls from "J.C. Hardin." As journalist Stuart Wexler has documented, Hardin contacted Ray repeatedly in March 1968. In the aftermath of King's shooting, the FBI even opened a file on him and interviewed St. Francis manager Allan O. Thompson. Thompson identified a photo of James Ashmore as Hardin. 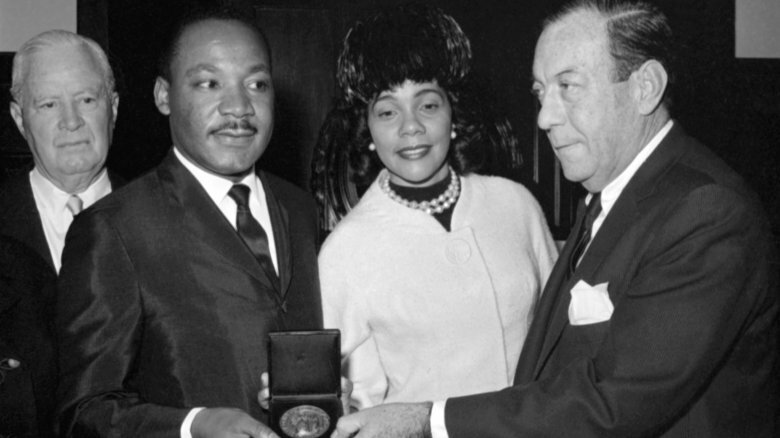 What was a white supremacist doing with Ray prior to King's assassination? Amazingly, that's not the really puzzling question. That puzzling question is why the FBI failed to follow up on Hardin/Ashmore. Despite Thompson's statement, the FBI decided Ashmore and Hardin had to be different people as they had different haircuts. The link was never investigated, and Ashmore died in 1973. When King arrived in Memphis the day before his assassination, it was to an unusual welcome. Memphis police inspector Don H. Smith was waiting for him with a four-man security detail in tow. This was unusual because King and his associates hadn't requested a security detail and really, really didn't want one. (If you're wondering why not, the equation "white cops + black leader accustomed to police harassment" should help you out.) Nonetheless, Smith and his detail stuck to King like glue, even when King and co. tried to lose them. 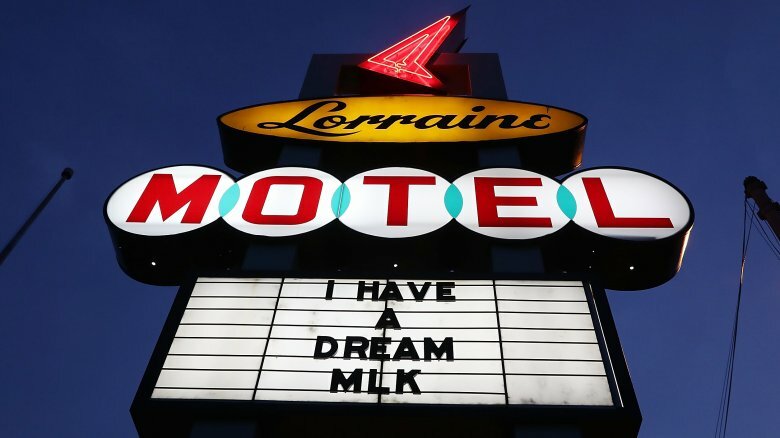 At the Lorraine Motel that evening, Smith telephoned the chief of detectives to ask if he really needed to be there. Smith was told he could stand down the detail, and duly did. But here's the thing. No one bothered to tell King's people that the guys there to protect them were no longer protecting them. In 1978, the House Select Committee on Assassinations (HSCA) would report that the detail's withdrawal was "highly improper." To this day, we still don't know why it was pulled a mere 24 hours before the shooting. HSCA found it likely wasn't the result of a conspiracy, but that still means a dangerously incompetent decision was undertaken with an embarrassing lack of oversight. Man, it's almost like the Good Ol' Boys in the Memphis Police Department had a grudge against King or something. After the Memphis Police security detail left, Detective Edward Redditt was posted to the firehouse across the road from the Lorraine Motel to keep an eye on King. The only black member of the force working on King's security, Redditt was about to become wrapped up in a mystery of his own. Just two hours before the shot rang out, a phone call came into the firehouse from someone threatening to kill the detective. Redditt was immediately pulled from surveillance duties. If you read up on the literature surrounding MLK's assassination, you'll find Redditt's name tends to be mentioned in the sort of tones usually reserved for lounge singers who claim to be Elvis. That's because Redditt spent the aftermath of the assassination falsely telling everyone who'd listen that he could have saved King if he'd still been there, eventually inflating his role from "surveillance guy" to "black superman." When he testified in 1978, the HSCA tore him a new one. But that doesn't change the fact that the mysterious death threat was apparently real, and we still don't know who phoned it in or why. According to professor Phillip H. Melanson, the disruption it caused could have been a contributing factor to the confused police response to the shooting. If that's the case, then there could be a significant bit-player to the assassination whose story remains unknown. When a major public figure gets gunned down, it seems only natural the FBI would get involved. But looks can be deceiving, and in 1968 there were ample reasons to think the Bureau absolutely was not fit to be investigating anything involving King. 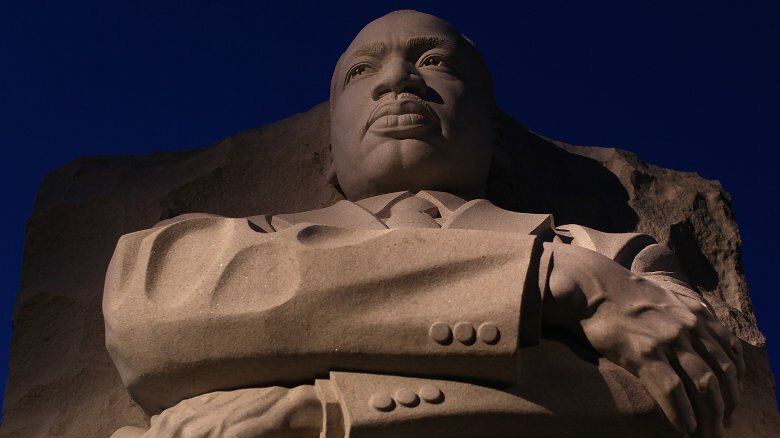 For over half a decade, the FBI had been dedicated to taking King down. They tried everything from blackmailing him to recording evidence of his extramarital affairs to trying to talk him into suicide. Washington Post has the details. J. Edgar Hoover hated King, and he didn't give a pair of ladies' undergarments who knew it. At a press conference he called King "the most notorious liar in the country." As early as 1963, the feds had been wiretapping King for evidence of Communist sympathies. 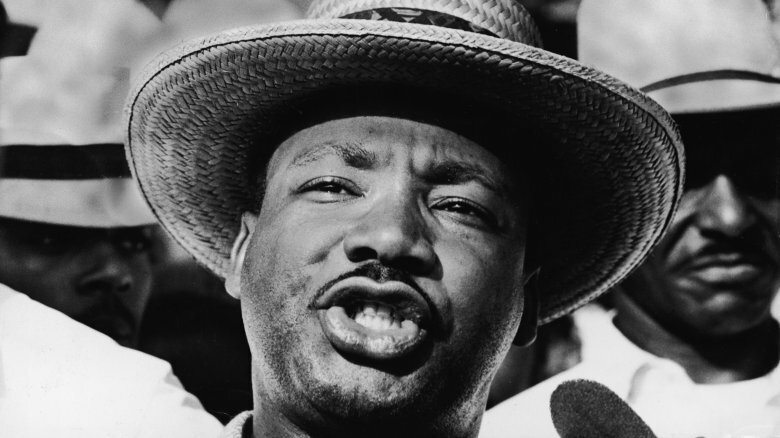 This may have been retaliation against a 1962 interview in which King insinuated that white Southerners working at the FBI made the institution untrustworthy. 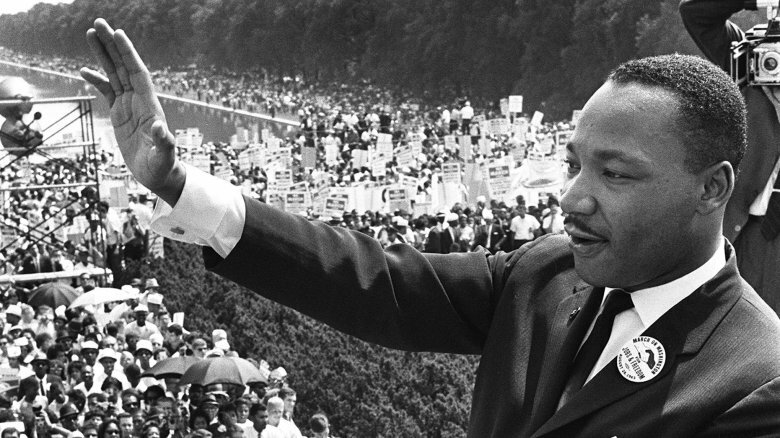 Whatever the cause, by 1968, the FBI had a deep, systematic bias against King. There's no suggestion the Bureau actively plotted to assassinate him, but it may explain the extraordinary number of leads the FBI refused to follow up after capturing James Earl Ray. At that stage, asking the Bureau to investigate King's assassination was almost like asking Yogi Bear to investigate who keeps stealing picnic baskets at Jellystone Park. You've seen the famous photo of King's assassination, with King's entourage all pointing as one at the building from which the bullet came. However, not everyone is convinced they're pointing at the right place. While the official account says Ray fired his rifle from a window, at least a couple witnesses claimed to have seen the gunman in the bushes below. One of these was Loyd Jowers, the owner of Jim's Grill on the first floor of the building. After 25 years of silence on the subject, he suddenly spoke up in the early '90s to say he'd seen a white gunman fire from the bushes. Now, Jowers' testimony is thought to be suspect, thanks in part to the way his eyes practically turned into dollar signs everytime someone mentioned the assassination, but that doesn't explain Earl Caldwell's story. A reporter for the New York Times, Caldwell was the only journalist to witness the assassination. He claimed to see a white man leaving the bushes just after the shot rang out. Given that he later told USA Today witnessing that moment had ruined his reputation as a serious journalist, it seems unlikely he's lying. Most curious of all is what happened to the bushes that may have housed the mystery gunman. The very next day, city workers cut them all down, potentially destroying any evidence (via Quartz). It's probably a coincidence, but still. If you have the hankering to get away with murder, you could do worse than committing the crime on Memphis Police Department (MPD) territory. 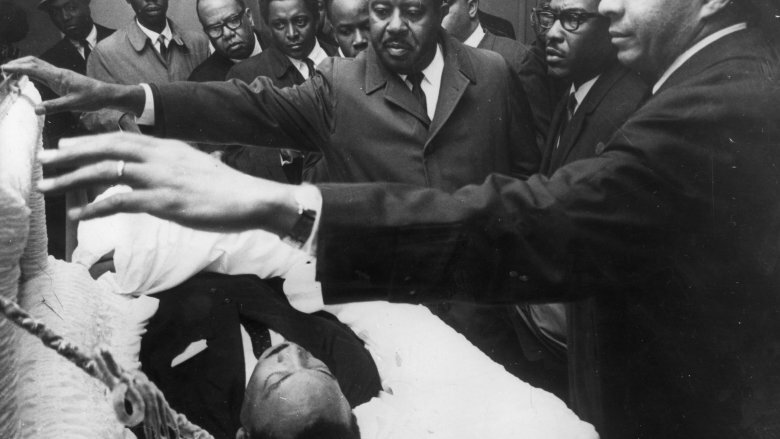 The MPD severely bungled the aftermath of King's assassination. After the gunshot rang out, MPD police radio operators didn't put out a request for a road block surrounding the Lorraine Motel for five whole minutes — plenty of time for an assassin to escape. We know this because escape is exactly what James Earl Ray did. By the time the two blocks around the Lorraine were cordoned off, Ray was already in his car heading out of the city. The whole sorry tale is available to read in the House Select Committee on Assassinations' report. Even after local police were finally alerted to Ray's getaway car (a white Ford Mustang), no one bothered to tell police in neighboring states. This turned out to be an unbelievable boo-boo, as Ray headed south into Mississippi before driving all the way to Georgia, where his car was found abandoned. He wouldn't be apprehended until two months later when British police arrested him in London's Heathrow Airport. On top of all this, MPD units that could have helped in the manhunt for Ray were instead diverted to crack down on black protesters and rioters who flooded the streets after King's assassination. Nothing like a bit of community outreach, huh? In the immediate aftermath of King's slaying, just as it was becoming clear that the MPD was staffed entirely by the Keystone Cops, law enforcement caught a lucky break. Three witnesses had seen Ray's white Ford Mustang leaving the scene and were now in pursuit in their Pontiac. Thankfully, one of them had a citizen's radio, and the trio were broadcasting their chase. And what a chase it was. As they left the city, the Pontiac hit 110 mph. The two cars barreled through red lights. Fifteen miles north of Memphis, someone in the Mustang opened fire on the Pontiac. Naturally, the MPD scrambled a fleet of squad cars to go screaming out after this impossible-sounding high-speed chase. There was a good reason the chase sounded impossible. It was complete fiction. According to reporter Matt Pulver, the "witness in the Pontiac" was making up the whole story as he went along. There was no chase. The geography wasn't even right. As MPD squad cars raced north, James Earl Ray was heading south, quietly slipping across the Mississippi border. It's a crazy story. What's even crazier is how much mystery still surrounds it. To this day, we have never managed to identify the broadcaster or figured out their motive. It could be they were simply trolling the cops. It could be they were deliberately diverting police resources away from Ray's real escape route. When a white man guns down a black civil rights leader in the Deep South of the 1960s, it's easy to assume it's related to race. Well, this is where things get interesting. 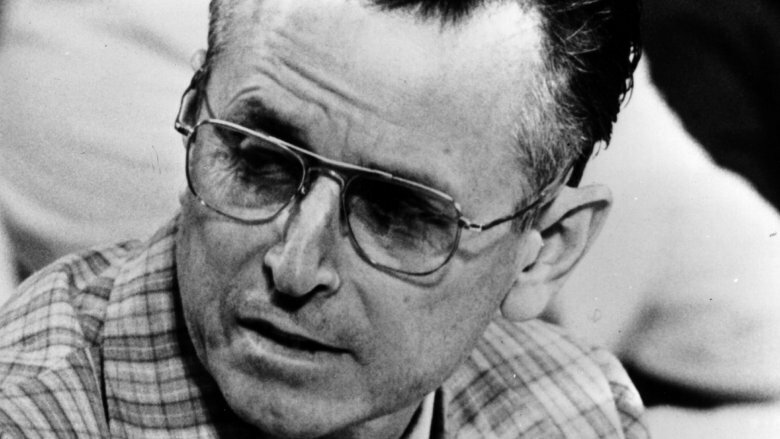 Despite James Earl Ray (above) living another 30 years after King's killing, we never found out why he did it. There's good reason to think that his motive may have been only tangentially related to skin color. Britannica has the details. For most of his life, Ray maintained his innocence. That meant no one could ask him why he did it, so people were forced to speculate. One of the most obvious clues came when Ray's ultimate destination after two months on the lam was discovered. He was heading to Rhodesia, now Zimbabwe, which was then a white supremacist state. People therefore assumed Ray was similarly obsessed with race. However, the HSCA didn't buy the white supremacy motive. During their 1977-78 investigation, they uncovered evidence that a group of George Wallace staffers in St. Louis may have conspired to raise funds for the assassination of King. They hypothesized the penniless Ray may have learned of the group then carried out the killing in hopes of claiming the bounty. Not that this lead could be followed up. By the time of the HSCA report, nearly everyone on the Wallace campaign was dead. One of the intriguing things about the House Select Committee on Assassinations is how few of their potentially explosive conclusions were followed up. The HSCA is most famous today for coming out on the side of the grassy knoll theory for JFK's assassination, but they also dropped a minor bombshell on the MLK case. In 1978, the committee concluded there was a decent likelihood that a conspiracy to kill King existed. But rather than being between the FBI and the Deep State, it was likely between James Earl Ray and his brothers. Ray's brothers, John and Jerry, both lied to investigators about their dealings with Ray in the months prior to the shooting. They claimed to have had no contact with him for years, despite evidence that they'd planned and conducted bank robberies as a way of funding their then-fugitive brother, who'd escaped from jail in 1967. More damningly, the committee found evidence that Ray had contacted at least one of his brothers in the run-up to the shooting and may have even gone with them to buy the rifle he used. The brothers' role gets even murkier when you realize the HSCA also found evidence of their working for the same George Wallace campaign where staffers allegedly raised a bounty to have King iced. Perhaps it's no surprise the HSCA criticized the FBI for failing to investigate John and Jerry back in '68. 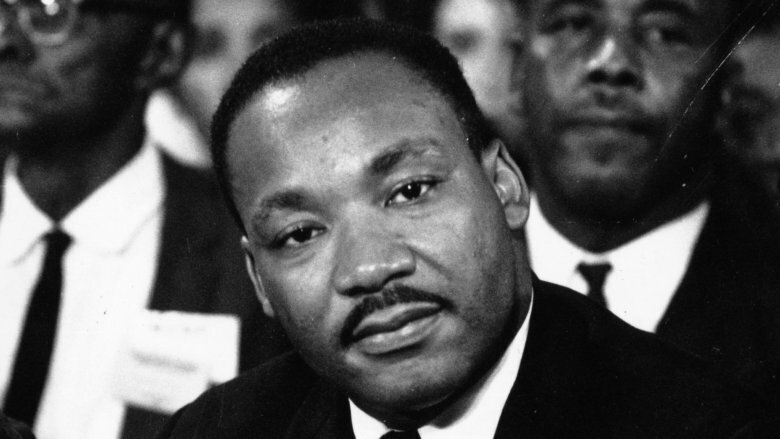 According to the court records, James Earl Ray confessed to killing Martin Luther King Jr. at his trial. In return, he received a life sentence instead of the likely death penalty. "But wait!" 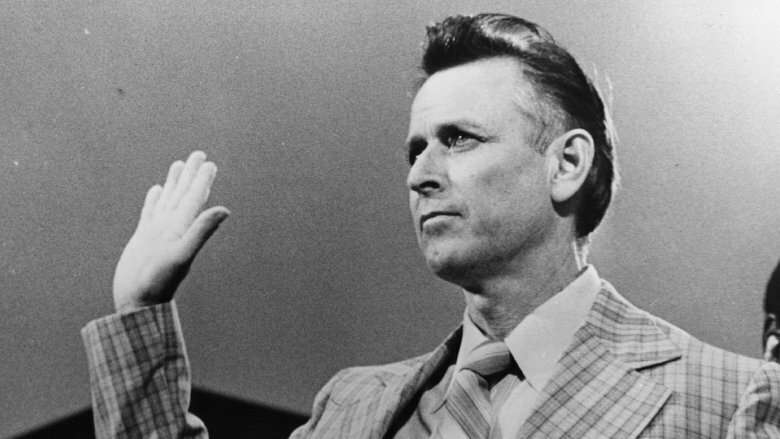 You may be thinking, "James Earl Ray famously protested his innocence. You even mentioned it in this very article!" You'd be right. Ray did indeed go to the grave claiming he'd been railroaded. He also spent the time before the trial loudly proclaiming his innocence. Yet when the time came to enter his plea, he went for guilty. This plea stood for less than three days before Ray was saying he was innocent again. The plea is controversial today because it effectively snuffed out the trial before it had begun. Rather than the catharsis of evidence and testimony, America had to settle for the catharsis of a confession … only for that confession to immediately be retracted. Yet Ray's case never went to retrial. Although there would be committee hearings and reviews over the next three decades, Ray never returned to the courtroom. For his part, Ray claimed he'd been tricked into his guilty plea by his lawyer, who wanted him to avoid the death penalty. Still, it's possible Ray was simply aware of what it would take to save his own skin, while also still giving him enough space to create the drama he thrived on. Given that James Earl Ray maintained his innocence, you might expect some fruitcakes out there to believe him. You probably wouldn't expect the family of the man he'd murdered to do so. 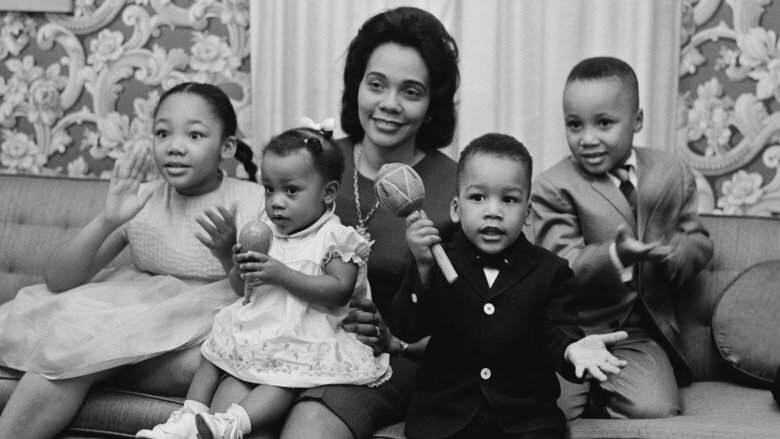 By the 1990s the vast majority of King's family (pictured in 1964) considered Ray to have been framed. Even today, with Ray over 20 years dead, some of King's children continue to advocate for his innocence. The lengths that the bereaved family went to to help the assassin sometimes defied belief (via Vice). The most striking moment of all came in 1997. That March, as Ray lay in the hospital dying of liver disease, MLK's son, Dexter King, arranged an on-camera meeting between the two of them. He asked if Ray had killed his father and when Ray said "no," King replied, "I believe you, and my family believes you." Head-scratching as this was, what came next outdid it in the weirdness stakes. In 1999, after Ray had died, King's family filed a civil suit seeking a symbolic $100 in damages. 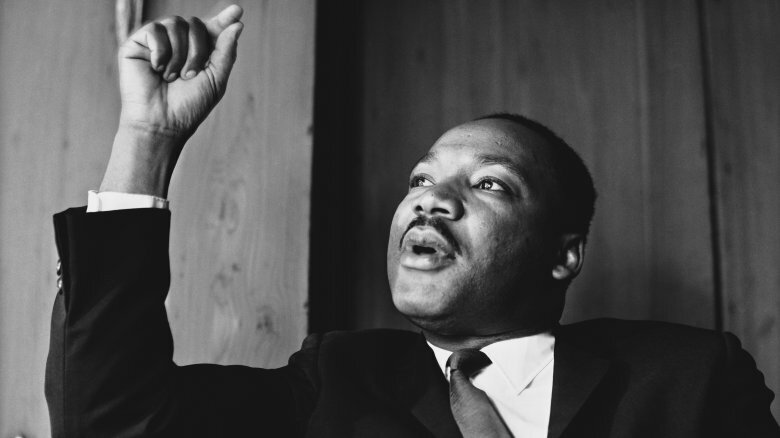 The lawsuit ended in a sensational trial during which Ray was declared innocent and the government and others were declared liable for King's death. Since this was a civil trial and all, it didn't really change anything, and the Department of Justice was quick to point out that Ray was still officially considered guilty. An 18-month DOJ investigation also concluded that no conspiracy existed. Regardless, the trial made for one heck of a moment in legal history. You gotta hand it to the U.S. judiciary. Those guys really know how to string out suspense. 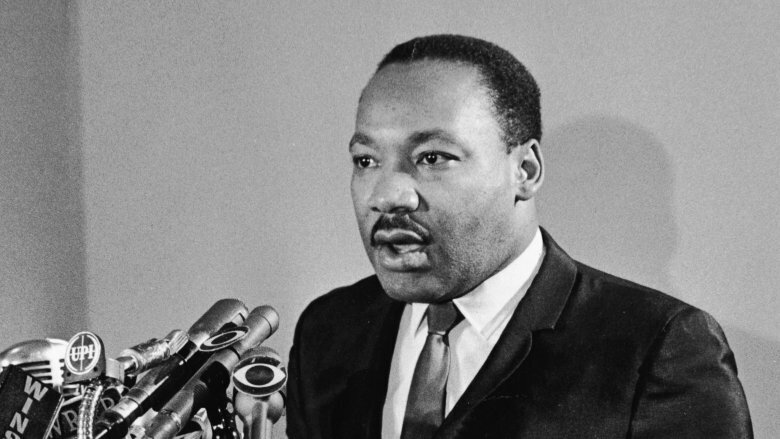 In 1977, just as the House Select Committee on Assassinations was getting underway, a court order sealed the FBI's surveillance records on Martin Luther King Jr. for 50 years. Just in case you both failed high school math and then tragically lost the majority of your fingers in a freak addition-based accident, rest assured that the release date is still in the future. Until then, as Smithsonian reports, all we can do is guess what's in there. The sealed files include FBI wiretap transcripts. Since we've known for a long time that the FBI believed it had evidence of King's extramarital affairs, probably at least some of them will contain the titillating spectacle of a titan of history seducing some pretty young thing. Others will likely be more embarrassing to the Bureau than to King. A file declassified alongside a tranche of JFK documents in 2017 was full of paranoid ravings by FBI agents claiming every single thing King said was vetted by the Communist party (via BBC). Still, there's always the chance they could contain something more. Evidence of a grand conspiracy seems unlikely, but documents relating to J.C. Hardin or the involvement of a white shooter in the bushes? You never know. We'll see you back here in 2027.